Although there is something of an unofficial ‘formula’ for rides, it seems that in reality Critical Mass models tend to vary around the world. Instead of meeting on the last Friday of the month, for instance, the Budapest contingent meets only twice a year. However, by concentrating their energies into just two rides, the cyclists of Hungary commit wholeheartedly to making these rides count: although the table below is a bit out of date, the statistics from 2013’s ride indicate that they had more than 80,000 riders at their Spring event – by the time the last cyclist had crossed the ‘start’ line, the rider at the front of the pack was already 13km away! 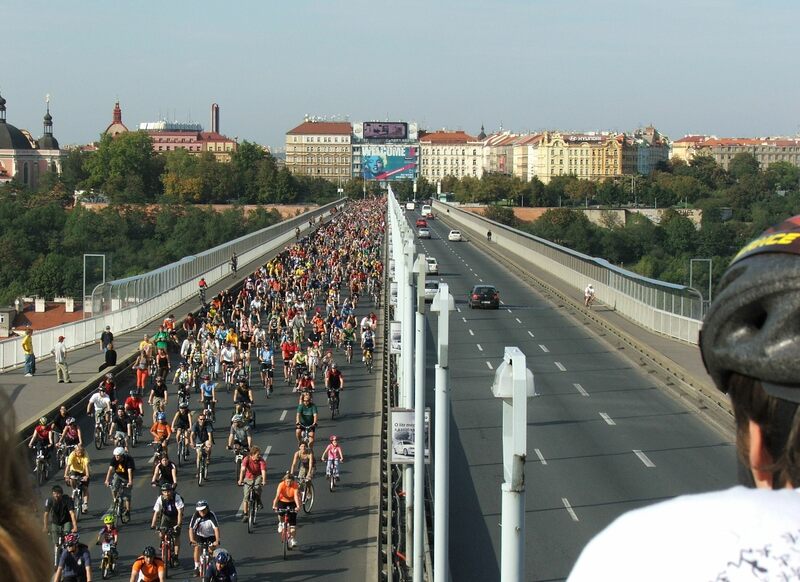 The Prague ride has also become hugely popular over the last decade, primarily though appealing to families, but also by coordinating with the police. Another thing that sets Prague’s Critical Mass apart from the traditional model is the clear set of ‘rules’ that it outlines on its homepage. Although Critical Mass riders are generally expected to stick to an unwritten ‘code of conduct’ (or ‘etiquette’) during the rides, the people of Prague have been more explicit about what they expect of participants. The rules are fairly commonsensical, but it seems like a good idea to keep everyone on the same page by writing them down and acknowledging them openly. We don’t want to be aggressive. We are not here against cars, but instead, on behalf of bicycles and a more pleasant city. We don’t want to shout at car drivers and will treat them with respect at all times! We don’t ride on pavements/sidewalks or on streetcar [tram] tracks. While I believe that the imposition of anything so concrete as a set of ‘rules’ goes slightly against the autonomous spirit of Critical Mass, I cannot deny that there is a lot to be gained by having a safe, sensible, and self-aware group of riders. A little closer to home, the recently re-branded Leicester Critical Mass describes itself as “a two-wheeled charm offensive.” With a different theme and dress code every month, it appeals to riders (partly, at least) because of its celebratory atmosphere. At this point, it is worth noting that the models employed by the most popular and successful Critical Mass rides today (such as those in Leicester, Budapest, and Prague) explicitly rule out confrontation. These cities have tailored their rides to work in their respective locations and by doing so they have grown to embody the true spirit of what it means to achieve a ‘Critical Mass’. When you have a peloton of 100+ riders then you cannot be ignored by other road users or relegated to the gutter – this is not only when you are safest and most visible, but also when you have the most fun! We are beginning to build this community in Edinburgh, but as we grow I think that it is worth considering how we ought to tailor our rides to suit our city. One-size-fits-all does not necessarily apply to Critical Mass, and if we are to continue to gain momentum and attract new riders then perhaps we need to get creative. Please share your ideas in the comments below, or bring them to the rides and meetings – all opinions and suggestions are welcome. This entry was posted in Bike Riding, Continental Cycling, Critical Mass, Cycle Safety, Cycling, Edinburgh, International Critical Mass, Positive Press, Uncategorized and tagged Bike Ride, Camaraderie, Critical Mass, Cycling, Cycling in Edinburgh, Edinburgh, Group Rides, Safety in Numbers. Bookmark the permalink. 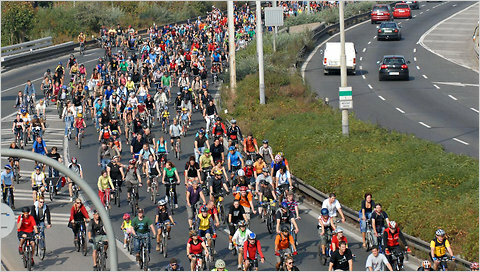 Critical Mass is an important international movement that strengthens the ties between people on bikes. Although individual bike riders can be intimidated by other road-users, the spirit of the mass is that there is strength in numbers. Cycling should be fun and freeing, and Critical Mass cultivates this atmosphere and reminds us that bikes are legitimate forms of transport that deserve space on the roads. That said, the formula for mass rides isn’t a one-size-fits-all model, and so it is worth acknowledging that different strategies work in different places. Good job Harry ! Having guidelines can only help, especially when it concerns the gist of what Critical Mass is all about. I like the idea of a festival spirit, and so themes, music and decorating all tie in nicely. I am thinking we could have a “Decorated bike” Day where we can encourage people to get themselves noticed in a fun way. We can help them by bringing coloured paper, stickers etc, and maybe do this as a daytime event and encourage families to come along. The pedal on Parliament day will have just this sort of demographic for notes of encouragement !? _Talk soon, and lap soon !